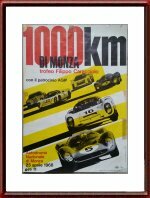 1968 1000 KM di Monza Race Poster - Vintage Original. It measures approximately 34 x 47.5 cm or 13.4 x 18.7. 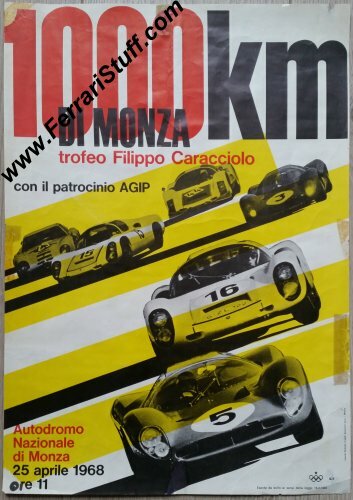 Great Ferrari 330 P4 motif with the winner of the 1967 event, the Ferrari 330 P4 (S/N 0856) of Chris Amon and Lorenzo Bandini in the background, another 330 in the foreground, an Alfa Romeo TZ and Porsches 906 and 910s. The 1968 race was won by Paul Hawkins and David Hobbs in their Ford GT40 (S/N 1074). Please note that this poster is as shown in the pictures and it has clearly lead a rough life... 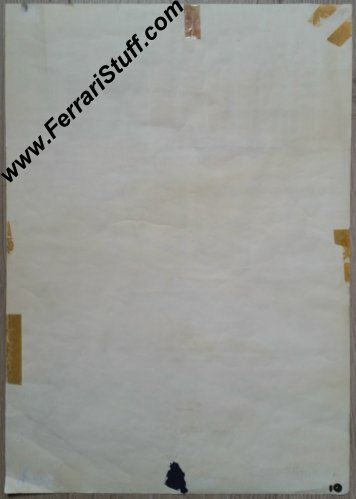 It has been taped to a wall (which has left tape residue), small parts are missing, text has been "repaired" with a marker etc. Just look at the pictures and you'll understand what we mean. Nevertheless, or probably thanks to its rough appearance, it oozes patina, just like an old racing car, which gives it an unrepeatable charm. We have adjusted the price to reflect its condition.